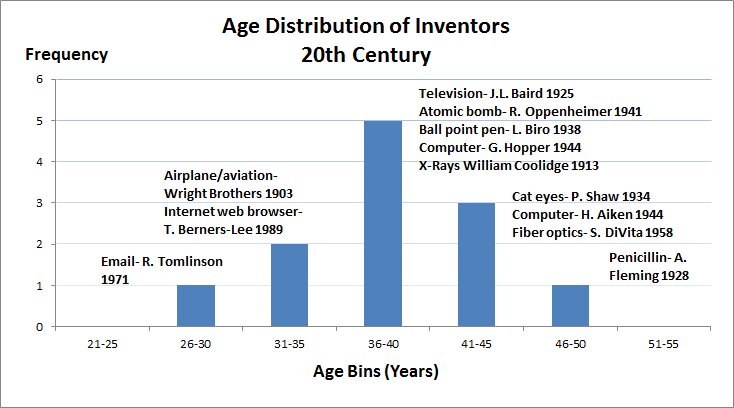 MacroMania: How old were the inventors of major inventions? 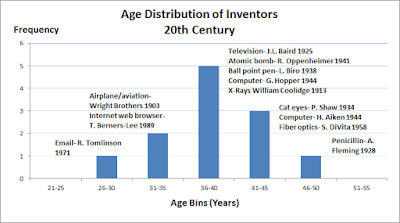 I came across this fun column the other day listing a number of Famous Inventions, like the airplane, the camera, electricity, the car, etc, along with their inventors. A thought crossed my mind: how old were these inventors when they invented these inventions? Were they young like Marconi, who invented the radio in his early 20s? Or were they old like Gutenberg, who invented the printing press in his early 50s? 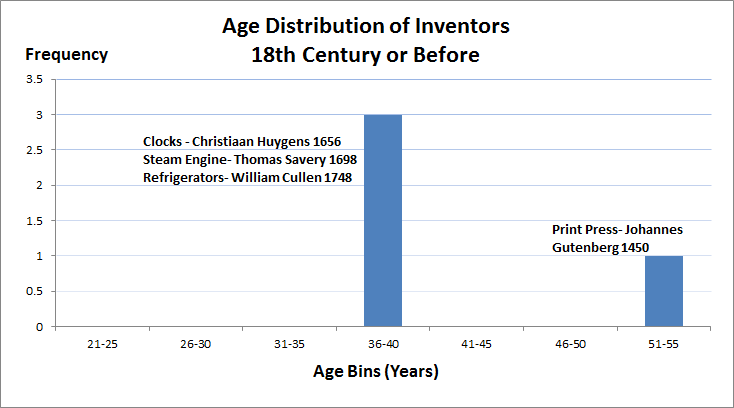 In short, is there an age demographic that is responsible for producing major innovations? Let's take a look at the data based on 34 major inventions listed in the article I cited above (thanks to Michael Varley for organizing the data). I have to admit, I was a little surprised--the median age is 40 (I was expecting younger). In what follows, I report the age distribution for different centuries. I'll save any commentary for another time and let you draw your own conclusions. Feel free to send me links to any literature related to this issue. 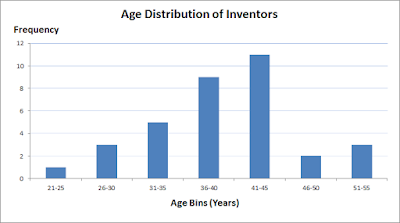 Postscript: The demographics of innovation in the United States. Reports that the median age for an innovator is 47 years. It's also interesting to note the disproportionate share of innovation attributable to immigrants and the children of immigrants. Ben Jones at Northwestern does a lot of good work on this. I invented artificial intelligence at the Christ-like age of thirty-three (33), but it was in theory only and it has taken me many additional years to implement Strong AI in software. 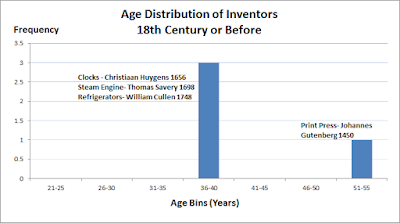 It's interesting to see Jones' estimates of median age at first invention rising over time. In the data above, it is declining. It would be declining even more if we normalized by life expectancy. We are working with a very small sample of major inventions, however. Joseph schumpeter, history of economic analysis, 1954, reported that most great economists had their Vision before the age of 30, and my idea has been that it takes some time, that in case you get it at the age of 40, you will not have the time to get great. Apart from technicalities, there is quite some marketing to do. Look at the age of US presidents. 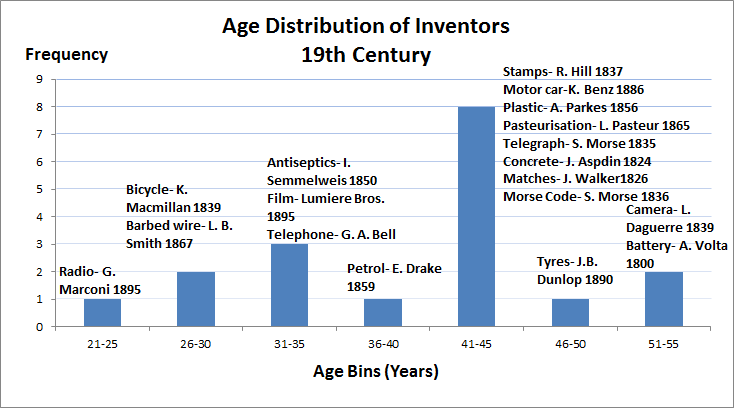 Hypothesis: age to have the skills required to get credit for a major invention is higher than age to make invention. Most are team efforts, with glory going to leader - who is typically older. In your infographic, you have a portion that reads, "Innovators are highly educated, especially in STEM fields." Yet the chart provides no information about the STEM portion of the statement. Could you provide some statistics on this?